I can only speak for myself, but I think one of the raddest moments in the history of recorded music is when the chorus drops in The Smashing Pumpkins' "Bullet With Butterfly Wings." The band is chugging along with this clean guitar part and a driving bassline over a pounding tom-tom riff, then Billy Corgan kicks on his Big Muff and wallops your ear drums with a wall of crushing fuzz as the drums go into a bombastic rock beat. Man, it gets me every time. Put that moment on a loop and I could listen to it for days on end. I share this not to inflict my musical taste on the denizens of the Wildwoodiverse, but to remind us all that Billy Corgan is one of the most innovative guitar heroes ever to lay pick to strings. The Smashing Pumpkins are so ubiquitous (and they spawned so many imitators) that it's easy to forget how revolutionary their music was when they first arrived on the scene in the early nineties. They managed to mix the bummed-out British vibes of The Cure and Joy Division with the heaviness of Black Sabbath, the textures of shoegaze, and the aggression of punk. Then, they married that sonic attitude with the ambition and technicality of seventies prog. What kind of space alien super genius dreams up that kind of sonic cocktail, and what kind of wizard is able to make it catchy enough to score multiple platinum records? The answer, of course, is Billy Corgan, and his ability to synthesize these disparate influences into a cohesive sound is one of the secrets behind the Pumpkins' success. Though Corgan is known for his incredible skill as an arranger and songwriter (he often weaves together fifty-plus guitar tracks to create his infamous "Pumpkin Guitar Overdub Army"), the dude can flat-out shred, too--check the solo in "Soma" off Siamese Dream if you don't believe me! Regardless, Billy Corgan is the sort of guitar hero whose epic, grandiose brand of rock and roll has the power to transport us far away from everyday life, a skill that is rapidly becoming a lost art. It's life-affirming music, but it also makes you want to headbang. Because of his playing is a singular blend of out-of-this-world creativity and virtuoso chops, Billy Corgan demands more out of his instruments than the rest of us. So, when Reverend approached him about making a signature model guitar, it was no surprise that he came back with a list of demands that seemed impossible for a mortal to fulfill. It had to be versatile enough for Billy to make it through an entire show without changing guitars, play fast enough to keep up with him during the breakneck moments that make the Pumpkins' music so exciting, and be a reliable live workhorse. However, his most daunting request was his simplest: that Reverend make the Billy Corgan Signature sound like no other guitar on the market. Take it from us, dear Wildwoodians: it's not easy to innovate in the world of electric guitars. There are only so many way to wind a pickup, and there are only so many tonewoods. Thankfully, Billy didn't entrust a mortal with this task: he asked Joe Naylor, the mad genius who founded Reverend Guitars. Joe proved himself more than up to the task, and after a couple years of painstaking research and development, the final product shattered all expectations. 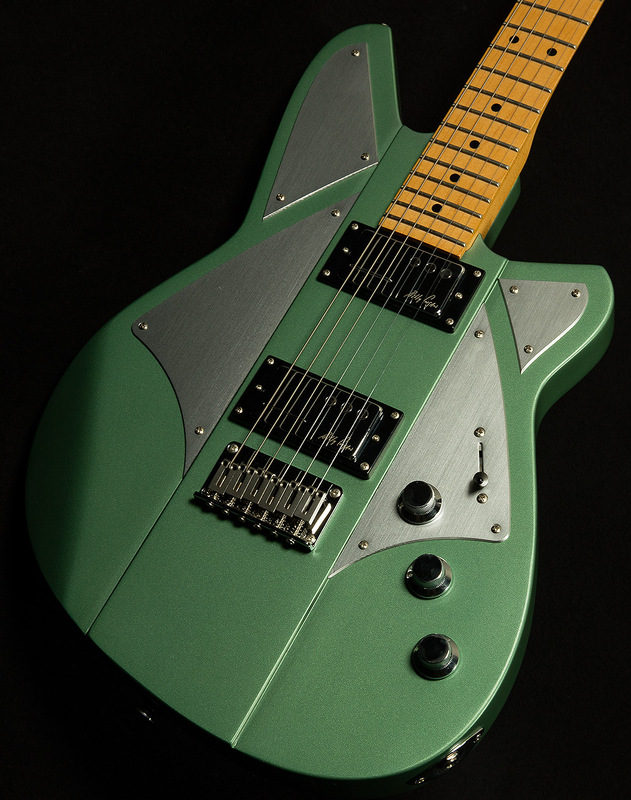 It was a guitar that combined Reverend's signature reliability and consistency with an entirely fresh sound. There are several things that make the Billy Corgan Signature such an exciting instrument. The first is the strategic chambers placed throughout the korina body that improve touch-sensitivity, resonance, and articulation. The second is the aluminum pickguards on the wings, which add just a hair of subtle high-end shimmer to the tone. Third (and most important): the Billy Corgan Signature Railhammer pickups. I have to admit, Wildwoodians, these pickups threw me for a loop. Writing about music is sort of like painting about architecture. Words often fall short, and we have to rely on thoughtful comparison to get the job done. A round, snappy Les Paul is rarely described on its own terms; instead, we reach into our bag of metaphors and call it a Telecaster on steroids. These Railhammer pickups defy easy comparison, but after much consternation, I think I have nailed their essence down. The bridge pickup is a complex amalgamation of several classic guitar sounds. It has the bite and punch of Jimmy Page's Telecaster tone--it's no coincidence that the first song this guitar inspired me to play was "Good Times, Bad Times"--and the thickness of Leslie West's legendary Mississippi Queen sound. It also has what Billy and Joe call "the Sabbath note," which is a very particular sort of vocal midrange response that Tony Iommi captured on most Sabbath recordings that emulates a cocked wah pedal. Above all this delightful midrange, you can hear an airy, open high-end full of blooming overtones thanks to the chambers in the body. When you roll off the bass contour knob, the bridge pickup takes on a whole new character. It sounds like an evil Jazzmaster crossed with an obese Rickenbacker. The lows are dry and clear, and the midrange emphasizes the fundamental quite clearly, but the highs have a beautiful lush, jangly character. If Robert Smith of The Cure had moved to America as a teen and played football in high school, he probably would have wanted his guitar to sound like this. Billy Corgan admits that he rarely uses the neck pickup for rhythm playing. So, since the bridge pickup already produces such an excellent array of rhythm and lead tones, he and Joe focused on making the neck pickup excel at producing thick tone perfect for delay-laden atmospherics and thick, blistering leads. It's beefy and juicy, and it has rich lows, but it still has plenty of percussive chunk thanks to its articulate attack. The highs are airy and transparent like the sky on a clear fall morning, and the low-midrange provides a walloping thump. 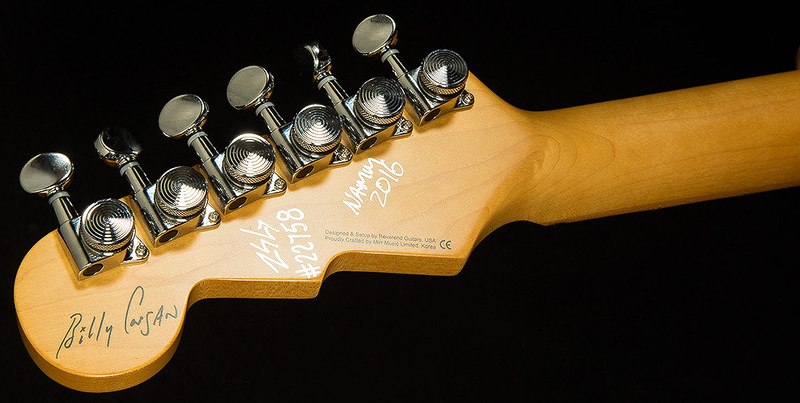 If you put the bass contour knob on the thinnest setting, the low-end tightens up and you get a delightful Strat-like quack in the upper midrange. All of this talk of frequency response is well and good, but I'll end with a quick anecdote that I think encapsulates this guitar's unique appeal. I stayed late to write this text because I knew I would get lost in the project (if you can't tell, I dig The Smashing Pumpkins). Naturally, with no one around I couldn't resist cranking up the amp to test the guitar--you know, for research purposes, because I am a conscientious writer. I can't remember the last time I got myself so completely lost in the sound of a guitar so quickly. I think I alternated between furious riffage and frantic note-taking for a good half an hour! I think we can all agree that, after 1250 words, I got a little carried away in my enthusiasm. I'm a child of the nineties, so I grew up listening to classic rock on the radio and watching modern rock videos on MTV. The Corgan Signature blends the aesthetics of both genres seamlessly to create something totally new, and it is utterly intoxicating. All this philosophizing boils down to one main takeaway: this guitar rocks, and it will inspire you to play for so long that you lose track of time and space.